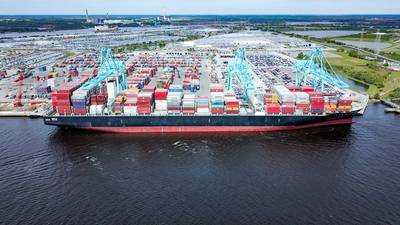 The Jacksonville Port Authority (JAXPORT) and terminal operator SSA Atlantic on Monday afternoon welcomed the largest container ship to ever visit Jacksonville. JAXPORT set a new port record today with the arrival of the ZIM vessel Cape Sounio, the largest container ship to ever call Jacksonville, claimed a press release. The 11,000-TEU (container) vessel is operated by ZIM on a service offered by the 2M alliance. The 2M alliance is comprised of Maersk, MSC, Hamburg Süd and strategic partners HMM and ZIM. The Jacksonville Harbor Deepening project will offer 47 feet of deepwater access, allowing vessels like Cape Sounio to call JAXPORT more fully loaded. The project is scheduled to be complete in 2023, based on continued funding from all partners, and includes the addition of a vessel turning basin. JAXPORT is also investing $109 million in berth rehabilitation and upgrades which are already underway and will allow the terminal to simultaneously accommodate two post-Panamax vessels. “We are grateful to our 2M alliance partners—ZIM, Maersk, MSC, HMM and Hamburg Süd—for making today’s milestone possible,” said JAXPORT Chief Commercial Officer Kristen DeMarco. “Investments like harbor deepening and our international container terminal at Blount Island ensure that JAXPORT will continue to provide efficient logistics solutions for our customers while growing our region’s economy through the jobs and economic opportunity these bigger ships bring,” Kristen added.